Piriform is one of most known non-huge software developers. For me personally their products cover whole range of emotions – I like CCleaner, indifferent to Defraggler, Recuva… Well, it takes me some minutes to calm down after I hear Recuva mentioned. 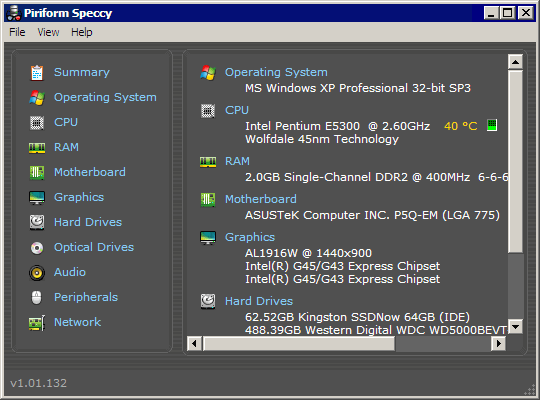 Speccy system information tool is their newest product, that had recently reached release version after months of beta. So where does it fall on the scale? As any other app of this kinds Speccy collects and presents information about computer hardware and (a little bit in this case) software. App has stylish and minimalist interface with summary page and sidebar links to additional info. One of the very few cases when I feel that developers just get usability. App looks original, but not obnoxious. Visual, but without abuse of extra details. It doesn’t get in the way of information. And since its only function is to serve information it works very well in this regard. As other Piriform apps it has native portable version available. On other hand quality of information is something that can make ugly app work or make you disregard interface beauty. On first look Speccy does its jobs – basic info is there. SSD are still bit of cutting edge, but find their way in consumer PCs; my Kingston SNV225 drive has most SMART attributes different from HDDs… Speccy fails miserably to interpret them or even make sense of manufacturer for it. These may not be critical shortcomings, but it takes some arrogance to deliver such generic quality under label of advanced system information tool. So on my emotional scale Speccy falls on surprised whom are you kidding. It is cute, it is streamlined, it is perfect for regular user. For a tech or power user it is poor attempt to score in niche full of highly advanced and much more accurate alternatives. VERY pretty. I almost want to take it home with me. Too bad it’s flawed. Maybe I could just use it for a little while. Not as much flawed as could use serious commitment… This is kind of app that just doesn’t end at putting it together. There is a lot of hardware around and it always changes.